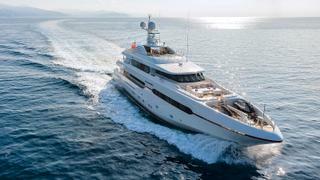 The 45 metre motor yacht Atomic, jointly listed for sale by Gilman Yachts with Worth Avenue Yachts, has had a further price reduction of $1,000,000. Designed by Paolo Scanu, Atomic was built in steel and aluminium by Turkish yard Sunrise Yachts to Lloyds class with delivery in 2014 and has had the same owner since new. Her interior, by Darnet Design, features light oak panelling and fine marbles, accommodating up to 11 guests in five cabins. These consist of a master suite, three doubles and a twin plus a Pullman berth, all with satellite television screens, entertainment centres and en suite bathroom facilities. The expansive main deck is split between a living room and formal dining area with comfortable furniture, large windows, a bar and an entertainment centre including a 50 inch LCD television screen and a server providing on-demand video and audio throughout this yacht for sale. The upper saloon is sumptuously cosy and is anchored by a long bar. Light floods in through high windows, and the whole space opens up via large doors onto the aft upper deck, where formal outside dining is available. Upstairs, the sun deck bar is protected by a large hard top with a wood surround, while forward is a spa pool. On the rear of the hard top a shooting trap sits ready to fling clay pigeons out over the ocean, offering endless hours of sport. Twin MTU 12V 2000 M70 engines give her a cruising speed of 12 knots, a range of 4,000 nautical miles and she is fitted with Quantum zero speed stabilisers. On display at the Palm Beach yacht show, Atomic is now asking $14,900,000.